SC-18 - SunStar Heating Products, Inc. The SunStar SC18 heater features attractive modern styling with up-to-date safety features like flame-failure protection and an oxygen detection safety-pilot or ODS. And, each model is CSA design-certified to the current national safety standards. Turn up your heat and turn down your costs. Piezo Ignition – No Electricity Needed. Works Even During Power Outages. 9 1/2" 19 3/4" 25" 24 lbs. All SunStar heaters mount easily to almost any wall. No optional floor stand is needed for the SC-18 model to be placed on the floor. Blower above is for model SC 18. Each blower is available in either manual control or an automatic thermostatically controlled model. To improve the distribution of the warmth throughout the room, most SunStar models accept an optional blower or fan accessory. What is an ODS and how does it work? The ODS is an oxygen detection safety pilot system. It is designed to shut off the gas supply to the heater if the oxygen content in the room drops to 18% from a normal 21%+. In this event the pilot flame actually lifts off the thermocouple cooling it down and causing the gas valve to close and the heater to shut off. Also, each ODS has a tamper resistant pilot orifice assembly, so do not try to drill or clean out the ODS pilot with a hard object as you will damage it. Follow the cleaning instructions located below. How do I clean the ODS pilot assembly? If your pilot will not stay lit, try cleaning it. Use a can of compressed air, such as is used to clean a computer, to blow dust out of the pilot assembly. Sometimes just blowing air back through the pilot will get rid of the dirt. If that fails, turn off the gas supply to the heater. As indicated in Figure 5 below grab nut A with an open -end wrench and loosen nut B from the pilot tubing with another small adjustable wrench. Blow air pressure through the holes as indicated. This should blow out any foreign materials. To reassemble, tighten nut B by grabbing nut A with the open-end wrench. WARNING: When the heater is reassembled, always check for gas leaks. Apply a soap and water solution to all joints and watch for bubbles to check for gas leaks. Never use any open flame to check for gas leaks. If that fails, you need to remove the orifice from the pilot burner cartridge using your wrenches to unscrew the orifice (Item A) and blow air through the pilot burner as show in Figure 5. If the pilot burner remains blocked you will need to use a soft brush (pipe cleaner will also work) to dislodge a spider web or other obstruction. To prevent damage to this assembly, follow the instructions below for disassembly and assembly of the ODS for cleaning. WARNING: Never use needles, wires, or similar cylindrical objects to clean the pilot orifice. This will only damage the calibrated pilot orifice (about the size of the head of a pin) which controls the pilot gas flow. Simple rinsing with water and blowing air over it should clean the orifice. It’s slightly different than some 3-plaque heaters you may have seen previously. Instead of turning on the pilot and then one, two, and three plaques, the SunStar Model SC-18 uses just two burner chambers and operates first on the single plaque burner. After the single plaque comes on, the double plaque is turned on – giving you three full plaques of operation. If only two plaques are needed, then the double plaque burner may shut off leaving just one plaque burning. Can a SunStar heater be converted to Natural or Propane Gas? 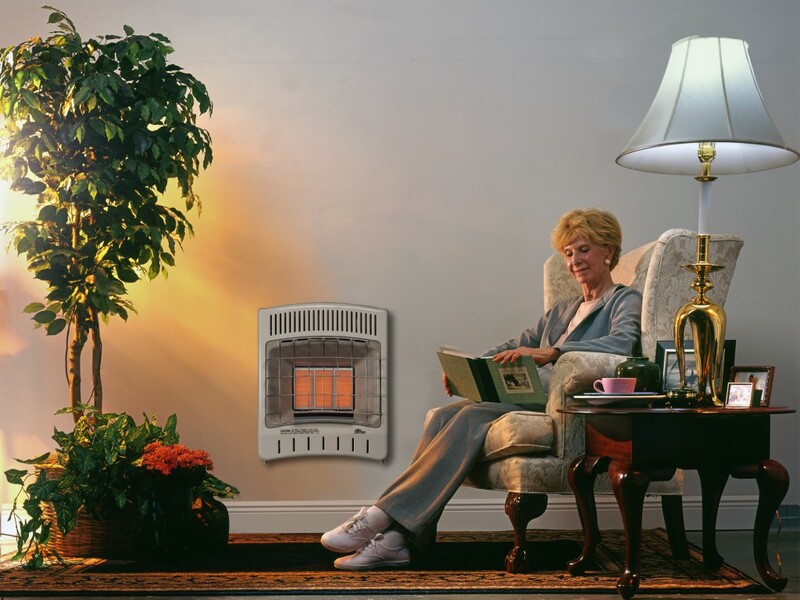 No, each heater is specifically designed to work on either Natural Gas or Propane Gas. Each heater is certified only for use with the type of gas indicated on the heater nameplate (data plate). It is not designed for use with other gases and is not convertible to use with other gases. Why doesn’t it need electricity? Each SunStar Corcho heater is equipped with a thermocouple incorporated in the ODS assembly. This is also the flame failure safety system. The heat from the pilot light warms the thermocouple and the dissimilar metals in the thermocouple react to the heat from the pilot flame and create a small amount of electricity (e.g. millivolts of electricity). This electricity from the heat is then used to energize a magnet in the gas valve to open it against the tension created by a spring in the gas valve. This allows gas to go to the burners. When the pilot flame is extinguished and is no longer generating heat on the thermocouple and, thereby, millivolts of electricity, the magnet de-energizes and the spring shuts the valve off. This is designed to turn off all the gas to the burner and pilot system. The use of this safety system and the gas fuel are the reasons that no electricity is needed to operate a SunStar Corcho heater. This product will still provide heat to your home even during power outages. Can these heaters be installed in bedrooms or bathrooms? The SC-10 model can not be installed in a bathroom. The SC-10 (rated at 9,500 Btu’s) can be installed in bedrooms. All other models are too big. The National Fuel Gas Code (NFPA 54) permits wall mounted installation of vent-free gas heaters of 10,000 Btu’s or less in bedrooms and 6,000 Btu’s or less in bathrooms. Please check with your gas supplier to determine if installation of these heaters in bedrooms and bathrooms are permissible by your state and local codes. Can this heater be installed in mobile homes? Yes, this heater may be installed in what’s termed “aftermarket” manufactured (mobile) homes where it is not prohibited by state or local codes. An “aftermarket” mobile home is defined as any type of mobile home that has already been sold to an end user or homeowner. It cannot be installed in a new mobile home on the dealer’s lot, before it has been sold, but it can be installed in any mobile home after it has been sold (e.g. aftermarket). When installing this heater in a mobile home, the same safety rules of confined and unconfined spaces and clearance to combustible materials should be followed.